Closing Gitmo 'Going To Be Very Difficult,' Hagel Says : It's All Politics The outgoing secretary of defense conceded his handling of the Guantanamo Bay detainee issue "hasn't always made me popular in some quarters." 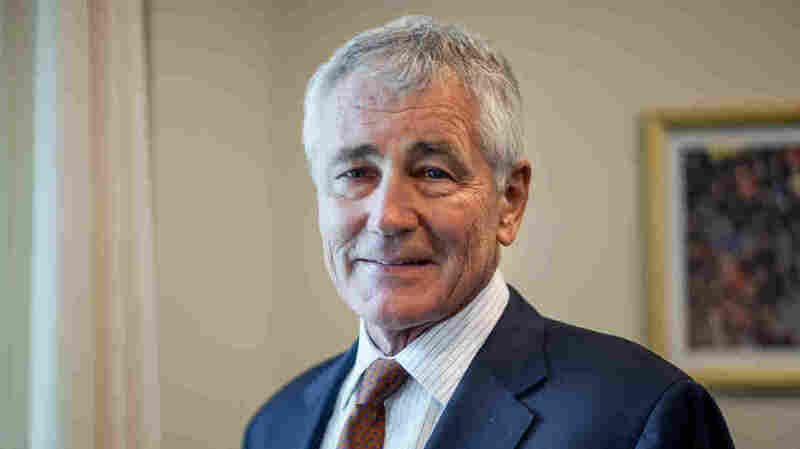 Secretary of Defense Chuck Hagel, shown here in his Pentagon office Friday, explained that transferring Guantanamo Bay detainees required action from many parts of the federal government. President Obama wants to close the prison at the U.S. Navy base at Guantanamo Bay before leaving office. But his departing defense secretary, Chuck Hagel, told NPR News the job is "going to be very difficult" to complete in that time. Hagel made that remark in an exit interview Friday, one of only a handful he granted as he prepared to vacate his expansive office at the Pentagon. The interview will air Monday on Morning Edition. His office looks across the Potomac toward the Capitol — where Hagel once served as a Republican senator — and President Obama's White House, which Hagel served for a surprisingly short time. Hagel's resignation, never fully explained in public, was privately blamed on a variety of factors — one of them being White House frustration with his handling of Guantanamo. No detainee could be transferred out of the prison until Hagel certified that the prisoner would be placed in some other situation where he would not pose a threat to the United States. This was not easy to do. In the NPR interview, Hagel said that transferring any detainee required action from many parts of the federal government. Diplomats, for example, had to find a country willing to receive each detainee, since there is no political appetite to allow them into the United States. Hagel added that he had a duty not to formally certify that any detainee could leave until there had been "substantial mitigation of risk of these individuals returning to the battlefield to threaten the United States or our people or our allies." "Has there been a slowing of that [process], which hasn't always made me popular in some quarters? Yes," Hagel said. "I've made that very clear to the president and to everyone, to the Congress: If it's my responsibility by law, which it is as secretary of defense, then I will do everything I can because the American people rely on that." When Obama took office in January 2009, he signed an order to close the prison by the end of that year. At the time, there were more than 240 detainees at Guantanamo Bay. By the time Hagel became defense secretary in 2013, 166 detainees remained inside the facility that was supposed to have closed years before. During his tenure, Hagel has signed orders to transfer 44 detainees, many of them in recent months. That was enough for President Obama to claim in his recent State of the Union speech that half the detainees were gone. But 122 remain. They remain, Hagel noted, precisely because they have been the most difficult detainees to place elsewhere. Can Obama keep his revised promise to close the Guantanamo facility before leaving office? "It's going to be very difficult," Hagel said, "especially if the Congress further restricts where these last 122 detainees go." Congress has already barred them from being sent to the United States.